The pager-sized box sends vibrations through small disks placed on a hand and foot, signaling the brain to breathe. As humans evolved over many thousands of years, our bodies developed a system to help us when we start running and suddenly need more oxygen. Now, using that innate reflex as inspiration, UCLA researchers have developed a noninvasive way to treat potentially harmful breathing problems in babies who were born prematurely. The technique uses a simple device that tricks babies’ brains into thinking they are running, which prompts them to breathe. Each year, about 150,000 babies are born after only 23 to 34 weeks of gestation, which puts them at risk for apnea of prematurity, a condition in which breathing stops, often for several seconds, accompanied by severe falls in oxygenation. The condition occurs because — in infants whose systems not yet fully formed — the respiratory system ignores or cannot use the body’s signals to breathe. Compounding the danger, premature newborns’ lungs are not fully developed, and therefore do not have much oxygen in reserve. When breathing stops in these periods of apnea, the level of oxygen in the body goes down, and the heart rate can drop. That combination can damage the lungs and eyes, injure the nerves to the heart, affect the hormonal system (which can lead to diabetes later in life), or injure the brain (which can result in behavioral problems later in life). Hospitals use a range of approaches to minimize the duration of premature babies’ breathing pauses — placing them on their stomach, forcing air into the lungs with a facemask and giving caffeine to stimulate the brain — but none is perfect and each carries other risks. According to Dr. Ronald Harper, a distinguished professor of neurobiology at the David Geffen School of Medicine at UCLA, even newborns have the innate mechanism that triggers increased breathing. 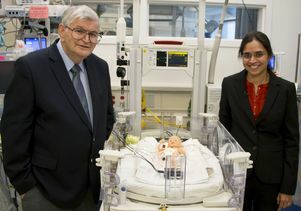 The idea to use an external breathing device to treat apnea of prematurity arose over a cup of coffee between Harper and Dr. Kalpashri Kesavan, a neonatologist at UCLA Mattel Children's Hospital, when the conversation turned to how a baby’s breathing could be supported if the brain was told the baby was running or walking. Harper’s lab, which focuses on brain mechanisms that drive breathing during sleep, had already developed a device that he had intended to test for treating people with breathing problems. The device is a pager-sized box with wires that connect to small disks which are placed on the skin over the joints of the feet and hands. (Placing them on the hands is another nod to how the human body evolved: Early humans ran on all fours, so nerves in the hands are still involved in signaling the brain that the body is running.) Once the battery-powered machine is turned on, the disks gently vibrate, which triggers nerve fibers to alert the brain that the limb is moving. 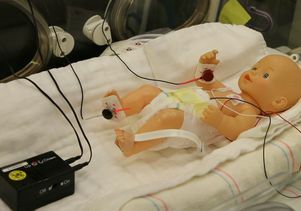 The researchers tested the device on 15 premature infants who were born after 23 to 34 weeks of gestation, and who were experiencing breathing pauses and low oxygen. The disks were placed on one hand and one foot, and the device was turned on for six hours at a time, followed by six hours off, for a total of 24 hours. The scientists compared the babies’ vital signs during the periods when the device was on with the times when it was off. They found that when it was on, the number of incidents when babies’ oxygen levels were low was reduced by 33 percent and the number of breathing pauses was 40 percent lower than when it was off. The device also reduced low–heart-rate episodes by 65 percent, which is especially significant because slow heart rate can impair the flow of blood to vital tissues. The findings were published online in the Journal PLOS One. The researchers now plan to study the approach on a larger number of patients and over a longer period of time. They’ll also study the effects of the device on blood pressure and other cardio-respiratory measures, as well as its impact on sleep quality. Breathing stoppages typically wake infants, and reducing the number of pauses in their breathing should lead to less disturbed sleep. While most premature babies eventually grow out of their breathing problems, it can take weeks to months before their respiratory systems develop sufficiently to allow them to breathe on their own at all times. Harper is also testing the device on adolescents who suffer breathing problems due to spinal cord injuries and adults with sleep-disordered breathing, including obstructive sleep apnea. The University of California has applied for a patent for the device, and is discussing its commercialization with several companies. The study’s other authors are Paul Frank, Daniella Cordero and Dr. Peyman Benharash, all of UCLA, and the research was supported by grants from the UCLA Children’s Discovery and Innovation Institute.